SecuritySolutionsWatch.com: We’ve all seen the headlines regarding the recent Citrix 2FA breach,Equifax, Marriott, MyHeritage, and Uber which have affected billions of users. The wake-up calls keep coming about password “insecurity” and it’s not as if Bill Gates didn’t warn us about this in 2004 when he predicted the death of the password.Your thoughts, Jim? Jim Miller: No question that distrust for enterprises managing private consumer data is at an all-time high. Continued data breaches, e.g. FEMA from late February, has begun to frustrate the masses. The recent WSJ report of a class action lawsuit about the growing use of biometrics in the workplace - and worker's concerns about the security, epitomizes this growing concern. 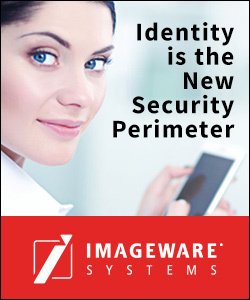 ImageWare helps to solve the password problem which is at the root of more than 80% of data breaches; our flexible, secure, and scalable biometric MFA solution strengthens or can even replace passwords. SecuritySolutionsWatch.com: Let's turn to ImageWare solutions to address this constant threat environment - please give us an overview of ImageWare's Digital Identity Platform, products and patent portfolio. Jim Miller: The announcement of our Digital Identity Platform at RSA , triggered immediate market traction. We now have all the products integrated together which allows a customer to create a digital identity – fully-vetted against a government issued document, which can then be used for reliable biometric authentication, and managed through its life cycle - all from one vendor, ImageWare Systems. From global partners, Fujitsu and ForgeRock, to our new deals announced with global telecom and commerce companies, ImageWare is positioned for the growth in biometric authentication. SecuritySolutionsWatch.com: Do you have customer and partner testimonials that exemplifies ImageWare's industry leadership? Jim Miller: Integrating GoVerifyID with ForgeRock’s identity platform brings our ultra-scalable and flexible 2FA, MFA and biometric authentication solution to this leading customer-oriented IAM solution. Earlier this year, Contactable entered into a five-year agreement with our company to re-sell our biometric products which have been fully integrated as a part of their offering. On March 18th, our 8-K filing disclosed that through Contactable, ImageWare has been awarded a contract to provide the biometric authentication as part of the services provided to a major multinational mobile telecommunications company. "Our valued partnership allows our customers to use the ImageWare Digital Identity Platform to easily integrate the most secure, flexible, and scalable identity proofing and biometric authentication solution in the market." Vic Herring - Vice President, Head of Global Software Center, Fujitsu Technology and Business America. "As a valued member of the ForgeRock Trust Network, the ImageWare Digital Identity Platform further strengthens our customers' digital onboarding and biometric authentication solutions." Ben Goodman - Vice President, Global Strategy and Innovation, ForgeRock. SecuritySolutionsWatch.com: Care to comment on GDPR Jim... is it fair to say that GDPR is an external market driver for ImageWare solutions? Any other external factors creating a strong headwind for ImageWare solutions you want to talk about? Jim Miller: GDPR, PSD2, and the California Data Privacy Protection Act may seem unconnected at first glance but these regulations deal with user privacy and security regulations. Privacy concerns and regulations are important market drivers and are expanding globally. ImageWare's Digital Identity Platform provides the most robust identity proofing for KYC 'know your customer'; AML 'anti money laundering' and strong biometric MFA. Add to this our patented anonymous techniques and you have an easy to use system that provides world class authentication and privacy protection. SecuritySolutionsWatch.com: Based on the growing worldwide traction, IWSY's impressive list of channel partners, strategic partners, and technology partners, and a market cap of only $140 million, it seems to us that IWSY is clearly poised for valuation and growth. You've just had ImageWare's year-end conference call - what are the key takeaways for the financial community you would like to emphasize here? Jim Miller: I'd like to point out what is fundamentally different about the ImageWare of today as compared with the ImageWare of the past few years. We've always known (as our long-time investors knew) that ImageWare was ahead of its time with a very powerful, best-of-breed scalable and patented biometric technology. The important question for us all was, "Could this technology become a successful business?" As you may have seen in the two recent 8-K filing announcements, that question no longer exists. The business from our partnership with Contactable, with the mobile communications carrier, puts ImageWare on the path to profitability. And, there are a handful of new transactions in the pipeline that we expect to announce in Q2. As to the question of why is this happening now - when for years consistent deals were elusive? What has happened is that the market - our biometrics market - has begun to catch up with us. Identity IS the new security perimeter. Throughout the world, companies and governments have spent billions of dollars to install firewalls, threat detection systems, and other products that protect the perimeter of their networks. But having spent those collective billions, we are still left with the facts as reported by Verizon: 80 PLUS PERCENT OF ALL SECURITY BREACHES ARE THE RESULT OF COMPROMISED PASSWORDS AND PINS. So, THEY SIMPLY DON'T WORK. SecuritySolutionsWatch.com: Thanks again for joining us today Jim! Final thoughts? Jim Miller: In business, technology adoption is hardly ever immediate or swift. The mobile phone, color television, and personal computer, staples in today’s everyday life, were not anywhere near immediate hits - taking many years to be adopted by the mass consumer market. So it is in the identity authentication space. Here at IWS we are seeing that change in real time. Folks, who over the past several years, were not ready or interested in securing their identity biometrically, are now realizing finally that the multiple levels of pain of multi-billion-dollar data breaches can no longer be tolerated. The market is finally catching up to us. They are also realizing that for the collective billions paid in network protection, it has not alleviated the problem. Identity IS the new security perimeter and as that reality takes hold, ImageWare Systems and its investors will reap significant benefits. Jim Miller is the Chairman and CEO of Imageware Systems,Inc.. Prior to that, Jim worked with the Mott Family Office and was a senior executive at Oak Industries Inc.(acquired by Corning) where he was Chairman /President of Oak Industries' Pacific Rim subsidiaries, General Counsel and a board member. Jim has a J.D. from the University of San Diego School of Law and a B.A. from the University of California, San Diego. ImageWare Systems, Inc. provides end-to-end digital identity proofing, authentication and management solutions as a cloud SaaS and on-premises. The company's Digital Identity Platform provides customers and partners with access to its patented technology for ultra-scalable and anonymous biometric authentication using nearly any vendors' biometrics.